I have collected a great backlog of photos over the last couple of weeks. I’ve been taking photos with my usual regularity, but posting less often as the spring bird season wears on and I grow more and more tired from the three-A.M. wake-ups and gradual accumulation of sleep deprivation. The last day of banding is Monday, after which I should (following a few days’ recovery period to catch up on rest) be back to a more usual posting schedule. These photos were taken a week ago, May 26. 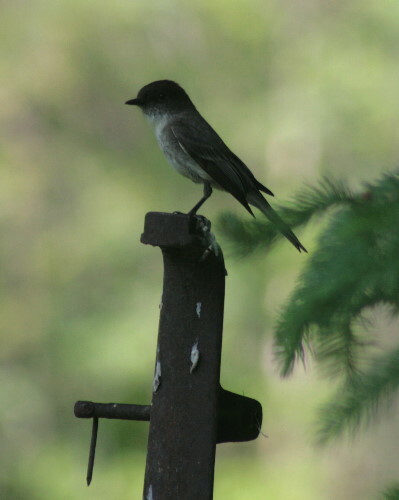 Back in mid-April a pair of Eastern Phoebes started showing interest in the old phoebe nest sitting on top of the bat box that hangs high under the roof overhanging the front door. Phoebes will re-use old nests from previous years, something that not too many birds do, generally because for most species last year’s nest usually disintegrates in the winter weather. Phoebe nests are built on ledges under overhangs and are normally fairly protected from the elements, allowing them to endure for many years. The adults will return to sites from which they successfully fledged young the previous year, and will refurbish the old nest with some new moss and fine-grass for lining. 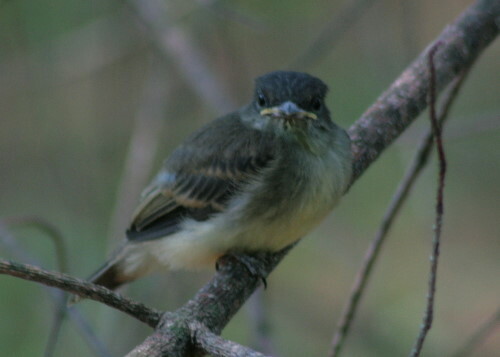 When we moved in last summer there was a brood of young phoebes just about ready to leave the nest, and it’s likely that the pair that arrived to use the nest this spring were the parents of last summer’s nestlings, as well. Two weeks of incubation and the eggs hatched, and then two weeks of catching bugs from the garden and stuffing them into hungry maws and the young birds fledged. During the whole process the phoebes were pretty tolerant of our comings and goings, and especially of Raven, who would lie in the shade on the porch for long stretches. Phoebes, robins, Tree Swallows… all pretty easy-going birds, when it comes to human activity. Once the chicks hatched the adult would often be seen perched in the maple tree a short distance away, cheeping at us with his “I’m not crazy that you’re there but I’ll just wait here as long as you don’t do anything drastic” call note. Dan set up the plastic lawn chairs under the maple, and could sit there in the shade in the afternoons and watch the hard-working adult flycatching in the garden, probably averaging a bug every minute or two. When the youngsters fledged, all five of them, they hung about the yard for a few days. In particular they seemed to favour one of the pines at one corner, and could often be spotted low in the branches. 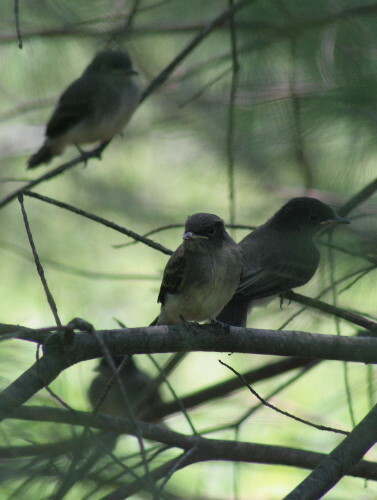 One afternoon Dan called me outside, saying the five fledglings were all perched together in some open branches of the tree. Fledglings will usually allow you to approach fairly closely (the younger they are, the closer you can get before they flush) and I eased up to within about ten feet of them, carrying my long lens to try to get a few photos. At that young age they’ve still got their fleshy yellow gapes (the bright yellow both acts as a guide for the parents to know where to stuff the food in the lower light of the nest site, and also as a visual stimulus that triggers an instinctual need to feed it within the adult bird – cowbirds use this instinct to their benefit when parasitizing nests, as they’ve got the biggest, brightest, flashiest gapes of all the nestlings) and their short tails, but the gapes will disappear in a few weeks, and the feathers will be full grown in next to no time. The adult perched on the old, weathered well handpump, chirping his displeasure at my presence so close to his young. I took my photos quickly, and then headed back inside to let them get back to the important business of eating and growing. This afternoon as I passed him on the porch, Dan pointed up to the old phoebe nest. The female is already settled in, incubating her second brood of the summer. In birds that will nest a second time the female often leaves the male before the first chicks are weaned to finish raising them to independence while she goes back to the nest, spruces it up, and starts laying her second clutch. By overlapping even just this little bit they get an extra few days or a week of the summer in which to raise their young. This might be her final brood of the season, as they’ll be due to fledge at the start of July, but if they were so inclined (and some birds are, though phoebes usually only raise one or two broods a year) their early-spring start means there’d probably be time enough to raise a third brood which would fledge mid-August. On the other hand… if I were the phoebe, by July I’d be looking forward to taking a break before having to head south again. 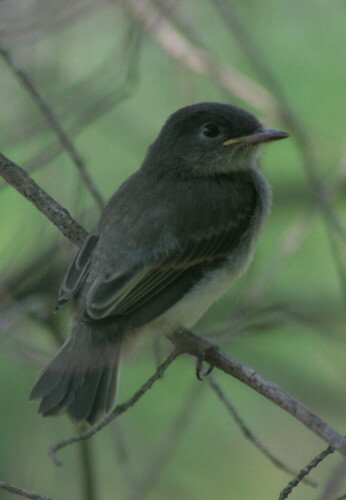 Dan has an ongoing series called the Nest Files on the Frontenac Birds blog, and he profiled the Eastern Phoebe last year. You can pop over there to read more about their nesting habits, and to see some photos of the nest and eggs. I really enjoyed this…and the photos too. My 2 phoebes come back every year and neat under my porch. Although Mom sits on the nest and they both fly back and forth getting food, I never see or hear the babies and then later in summer parents are gone. I hear them out in the woods then. So were there really any babies?